if there is any sign of overheating -warm plugs or switches, charred sockets, suspicious smells – the most likely cause is a poor connection; the screw terminals (or, with 13-amp plugs, the fuseholder) of a plug are more likely to be the source of trouble than the fixed wiring connections. Next, how fully does the system meet the needs of the household? there should not be long flexes trailing across the floor apart from the risk of tripping over them, the flex conductors can be damaged by being squashed and are a fire risk. It is worth trying to determine the type of insulation used in the wiring, and its age: pre-war wiring will have been done with rubber-insulated or lead-sheathed cable, and the rubber will probably have perished by now particularly where it has been hot (in ceiling roses, for example). More recent rubber insulation (it was used until the early fifties) may have more life left in it but not much. The differences between rubber and plastic are quite pronounced – rubber is dull and matt in appearance, slightly elastic in fee! (unless it is perished, when it becomes crumbly); plastic is more shiny and bright. The sheath around a rubber-insulated cable will probably be of rubber itself, oval in cross-section and black in colour; plastic-insulated cable will usually have a flat plastic sheath, grey or white. The type of sockets used in the house can give only a rough guide to the age of the installation although post-war wiring will normally have rectangular-pin sock­ets and pre-war systems round-pin ones, rectangular-pin sockets may have been used to replace round-pin ones without the wiring being updated. Look out for signs that the wiring was installed or has been extended without care; if the cable has not been laid and secured neatly, there is some cause for worry about whether connections have been made properly. 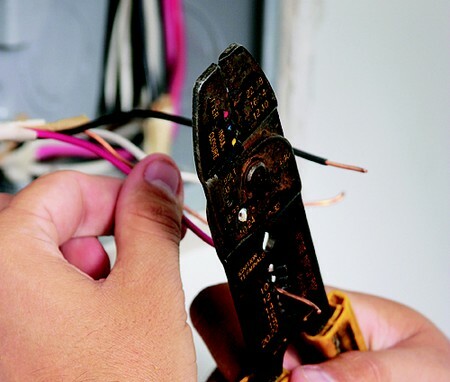 Any wiring system that still has old rub­ber or lead insulation or sheathing is likely to be near the end of its useful life (or past it), and the only sensible course of action is to replace it with modern PVC wiring. If you have an inadequate PVC wiring system, you will have to make a judge­ment about whether it is possible to extend certain circuits or whether you would do better to start again from scratch. The two things you want to avoid are having lots of wiring hanging about under the floorboards which does not lead anywhere and having sockets in any one room (or even on any floor) which are connected to different circuits both these increase the dangers for any future work. 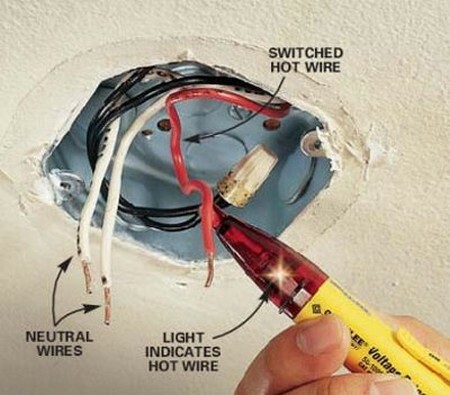 If you are in doubt about the state of the existing wiring, it makes sense to get help in accessing it. Electricians and Electricity Boards can provide various sorts of help, from a quick look around to a detailed set of electrical measurements and thorough inspections. Choose electrical contractors on the roll of the NICEIC (National Inspection Council for Electri­cal Installation Contracting). From the standard report form used, it is not always easy to tell what needs to be done to put things right you may have to ask the contractor. If you decide to make any changes which add to the total current which the house­hold can draw from the supply, you should tell the Electricity Board so they can be sure that their equipment the service cable, the service fuse and the meter – can take the new total current. Your own main switch must also be large enough.